Healthy moms raise healthy kids. As moms, we play a big role in our children’s choices and behaviors. I’m always looking for healthy ways to keep my kids active, and to fuel their healthy lifestyles. One of the best ways we can keep our children healthy, is by fueling their bodies with the proper nutrition needed. Just as I tell my clients, people (and kids) get healthy inside before they look healthy on the outside. Why is this critical especially for kids? Nutrition for your children has a direct effect on IQ, learning, concentration, sleep, and behavior. Just as athletes eat a diet to win, children can eat to learn. Foods that contain antioxidants, choline, omega-3 fatty acids, and complex carbohydrates are all particularly helpful in boosting brainpower! PLUS, did you know that fruit and vegetable consumption in the United States is dropping to surprisingly low percentages, with only 14% of Americans eating enough fruits and vegetables every day? As a busy mom of two active little boys, I know how hard it is to make sure my family is eating healthy. YES, even me! So, I want to share my secrets and my BeyondFit Kid approved healthy recipes with you! Take advantage of my FREE BeyondFit Kids 7 Day Meal Plan to ensure your children are getting the right nutrition they need. I hope some of our favorite recipes will provide some brain boosting power and lead your children to live healthy lives! 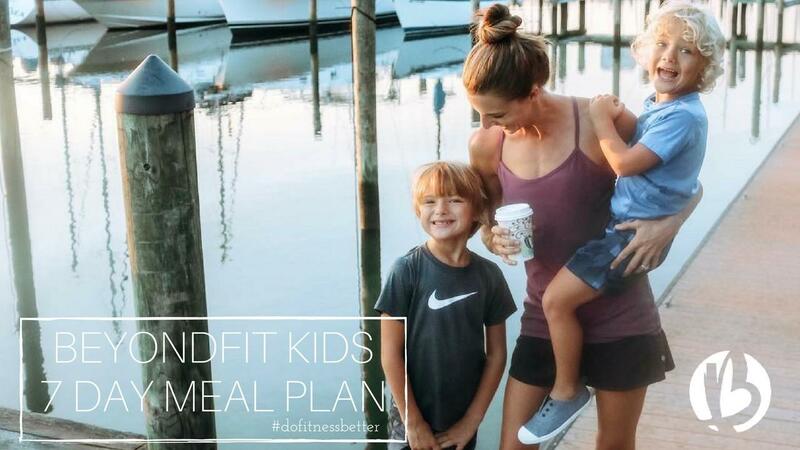 Download your FREE BeyondFit Kids 7 Day Meal Plan today.